I didn’t photo document the weekend whilst I was there, I was too much in awe of everything that was going on and slothful for that. This was the second time in six months, yes 6 months I’ve been away with this ‘other’ group of girlfriends; let’s call them ‘the quilters’. Everyone apart from myself, did some quilt sewing, planning, cutting of some sort. But not me. I was tempted, oh boy was I tempted. Stepping away from that awesome sewing room, with it’s quilting wall (where you can place your fabric patches up on some batting hanging from the wall and step back to see your quilt taking shape), I realised what attracted me to the new craft. 1. The fabric – it goes without saying, the printed fabrics were stunning, the colours and shapes, appeals to the designer in me. 2. That quilting wall – the arranging, the re-arranging, the playing with colour, pattern, design; hook, line & sinker. oh that’s right, I don’t like using a sewing machine. Phew… that was one close call. Instead of sewing, I did some spinning and I knitted on my flying saucer socks. 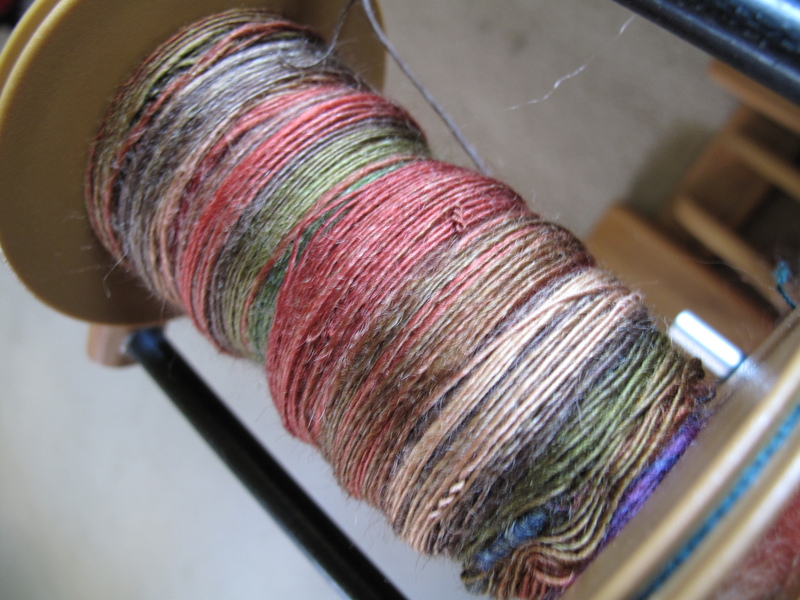 I’m spinning some of Kathy’s Fibres: BFL/Kid Mohair, to make 3 ply socks. 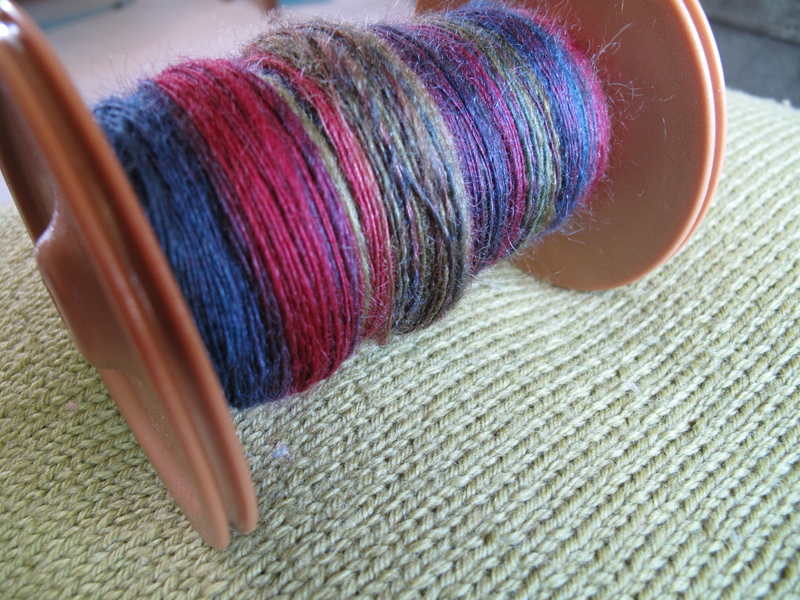 This is my first attempt at spinning for socks, I’m hoping it won’t be a complete balls-up. Afterall, I’ve joined The Thylacine’s Sock Fibre Club, there is more sock spinning in my future. The weekend was a feast for the senses. Not only was I witnessing some amazing projects come together, every meal was like eating at a 5 star restaurant. After lunch on Saturday, I had to have a lay down to recover. Who knew spinning and eating and take it out of you? Beautiful singles. Sounds like a great weekend. Love your new blog! It’s so clean and crisp! Bwahahaha, I’ve spent the last six months odd trying to stop myself from eyeing quilting with interest. I DO NOT need another craft hobby. But, but, but… pretty things! Good thing my sewing machine is a bit arse-tastic. When it takes me ages to sew a basic straight seam on a skirt, I come to my senses and remember that perhaps quilting is not for me. Or not yet anyway…. If I was at the least bit inclined to sew, I’d be totally done for. Avert your eyes and avoid fancy fabric stores is my advice!